Source ©2007 Publications International, Ltd.
By the mid-1960s, the International Scout and Ford Bronco were poaching in Jeep territory. Clever use of the parts bins gave the Toledo firm a way to fight back: the 1967-1973 Jeepster Commando was launched. In 1966, Jeep was a company on the verge of change. Its full name then was Kaiser-Jeep Corporation, and it was the sole U.S. remnant of both the old Willys-Overland and Kaiser-Frazer automobile companies. A merger of those two automakers, in April 1953, had failed to stem losses from car production, so even before the 1950s ended, the Jeep line of vehicles was the only one still being produced by the company in America. The Kaiser automobile went on to survive in Argentina for a bit longer, while the Aero-Willys mobile was produced in Brazil from 1960-1972. By October 17, 1966, the date on the above rendering, the basic shape of the Jeepster Commando had been decided. The Jeep product line was going through changes. It began with the small Jeep Universal, a.k.a. CJ. The venerable Jeep Station Wagon, first introduced in 1946, had remained in the lineup through 1965 despite being overshadowed when it was joined, in 1963, by the all-new Wagoneer. The rest of the line consisted of trucks. The basic Jeep pickup, first introduced as a 1947 model, shared its chassis and front-end styling with the hoary old wagon, and when they were dropped at the end of the 1965 model year, both the wagon and pick-up seemed ancient. Various tops were offered for the Jeepster. A more modem line of trucks, the FC (Forward Control) series, had arrived in 1957, but offbeat styling and nontraditional cab-over engineering made them slow selling oddballs in the marketplace. They were still in the line, but 1966 would be their last season on the market. The workhorse and show horse of the Jeep truck line was the Gladiator pick-up, based on the modern Wagoneer chassis and likewise introduced as a 1963 model. In addition, the market was changing. Jeep was then, as now, synonymous with four-heel-ve vehicles, but the four-wheel-drive market was in its infancy and could barely support the few small makers that competed in it. The Pick-Up featured interiors that tried to get away from bleak painted surfaces. During the first years after World War II, Jeep had the market pretty much to itself, with the only competition coming from a handful of aftermarket four-wheel-drive conversions of regular pick-ups, a few imports, the Dodge Power Wagon, and International Harvester pick-ups. But in 1960 International Harvester introduced a new product, the Scout, to do battle with Jeep. 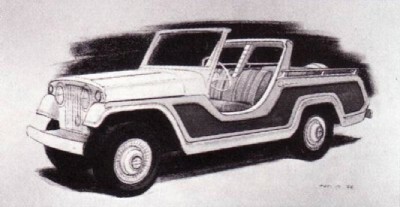 Its modem slab-sided body made the Jeep wagon appear even more dated than it already was, and its range of body styles covered the market. A basic roadster was available in two- or four-wheel drive, as was a pick-up version, while a station wagon model won the hearts of many a sportsman by providing a hunting-fishing vehicle that could also haul the family around in style. The new Scout quickly established itself and sold in decent volume. True, it wasn't a "real" Jeep, but then again Jeep wasn't quite the magical name it is today. The Jeep Wagoneer was larger and competed in a more upmarket slot when it arrived in 1963, and for a while it seemed that the two makers could eventually learn to split what business there was available, coexisting as competitors in a slowly expanding market. But Ford put an end to that hope in 1966 with the introduction of the Bronco. This was a new market segment for Ford, yet in its first year it produced more than 23,000 units, good volume indeed. 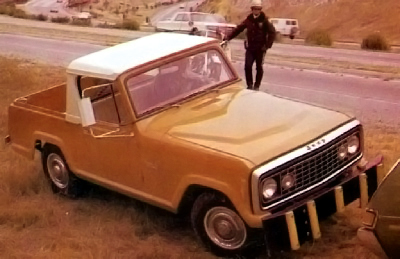 Ford stated that the Bronco was "a stablemate of Mustang," and one couldn't help but notice that the four-wheel-drive wagons were becoming ever sportier and less utilitarian. 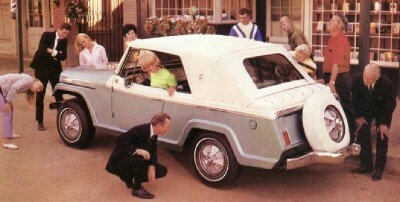 This Jeepster Pick-Up featured sporty full wheel covers with fake knock-off hubs. Against this handsome new Ford and the solid, sturdy Scout, Jeep had only the tiny Jeep Universal and the much larger and costlier Wagoneer with which to compete. A new mid-size product was needed to do battle in the market that was obvious, because if Jeep lost the mid-size 4WD wagon market, it might soon lose the rest of the business, plain and simple. 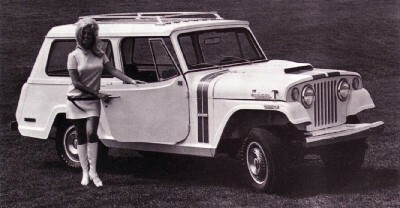 The Jeepster Commando was introduced in January 1967 to compete with the Bronco and Scout. Continue on to the next page to learn more about this exciting new vehicle. But Jeep always had a talent for wringing new models out of old tooling, and it proved up to the task of bringing out a competitor for the Bronco and Scout. This new Jeep, christened the Jeepster Commando, was introduced in January 1967.In choosing that name, Jeep was harkening back to a vehicle from its recent past. From 1948 to 1951, Jeep, then called Willys-Overland, had built the famed Jeepster, one of the last true roadsters made in this country. That Jeepster Sports Phaeton, as it was called, was a fairly expensive niche vehicle, and though admired by many, it was purchased by relatively few. All Commandos shared the same handsome sheet metal, with the model differences being noted chiefly by the roof. 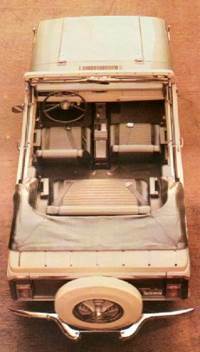 The Pick-Up featured a metal cab top over the front seat, while the Station Wagon had a full top. The tops were bolt-on affairs, so they were removable (although not easily). The Roadster could be ordered with no top at all, a full soft top, or a "cab top" that made it a convertible pick-up. The deck lid was also white and trimmed with chrome strips. Standard on this Jeepster was a folding top with glass rear window, color coordinated front and rear floor mats, "Continental" spare tire with cover, and hubcaps. Engine choices were limited. Standard was the "Hurricane," Jeep's dated four-cylinder F-Head engine, which was running out of wind by 1967 and put out just 75 horsepower from 134 cubic inches. This engine came with a three-speed manual gearbox only, since it was really too underpowered for the automatic. But power lovers could -- and usually did -- order the optional "Dauntless V-6," a 225-cubic inch, cast iron, overhead-valve unit built on tooling Buick had used for several years before selling the line to Jeep. The V-6's robust 155-160 horsepower was more than ample for the Jeepster, and could be had with either the standard three-speed or an optional three-speed Turbo-Hydromantic built by GM. Although the Jeepster Commando had a lot to offer, the interior decor was not particularly attractive. Designed dashboard aficionados could get bored staring at the Jeepsters dash, since it was mostly painted metal. A rectangle directly in front of the driver housed the speedometer, odometer, and turn signal indicators, while a smaller rectangle to the left held four rocker switches for lights, wipers, washers, and heater fan. In addition there were two dial switches nearby for defrost and heater temperature. The center of the dash held the optional radio, if so ordered, while the area in front of the passenger was painted metal, broken only by the glove box door and a cigarette lighter. A stylish console added a touch of class to the Jeepster Commando. Still, the Jeepster was in line with the times. As Alex Markovich noted in a Popular Mechanics article at the time: "Generally, the Jeepster is finished neatly and tastefully, though not lavishly. Areas of the doors and side panels that lack upholstery are finished in crackle paint that resembles leather. All body panels fit perfectly." 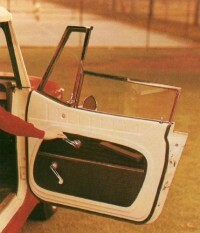 The doors and side panels were upholstered, again not lavishly, but handsomely for the times and type of vehicle. Jeep pulled out all stops to launch the new series. To simplify the rest of the lineup, the old CJ-3B -3A models were dropped. Lavish full-color catalogs were printed, and the auto press was supplied with test cars. Front bucket seats were standard, though seating was a bit snug in the back. Pricing was reasonable, with the basic Roadster listing at $2,466, the Pick-Up at $2,548, the Station Wagon at $2,749. The Jeepster Sport Convertible was at the top end, at $3,186, although it, like the rest of the line, generally went for quite a bit more when the optional items were tacked on. The series was called C-101. The 1968, 1969, 1970, and 1971 model years did not introduced many changes to the Jeepster Commando, but a change in ownership did happen. The city of Toledo, Ohio, boosted the hometown product by using the 1969 Station Wagon for Traffic Control. There were only a few changes to the style features of the 1968, 1969, 1970, and 1971 Commandos. The Convertible received a revised rear body to allow a hinged tail-gate for easy access to the storage area as well as a revised top. Prices went up: stripped Roadster, $2,730; Pick-Up, $2,817; Station Wagon, $3,005; Convertible, $3,442. New competition entered the sales arena in 1969 with the appearance of the Chevy Blazer. Some industry analysts were noting that the trend in four-wheel drivers was toward what they termed "larger, softer units" -- meaning more the size of the big Blazer than the smaller Jeepster. There were scant changes to the Jeepster line for 1969, the addition of side marker lights being the most obvious. A determined Convertible was added to the Commando series to allow for a lower price, which now started at $3,005, making it cheaper than the $3,113 Station Wagon. Perhaps the biggest development for Jeep was being decided in private conversations that would not come to fruition until 1970, when a few other changes were planned as well. Also shown that year was a new prototype off-road two-seater, dubbed the Jeep XJ001, to gauge public reaction to the idea of a sportier Jeep. The 1969 talks led to the February 1970 purchase of Kaiser-Jeep Corporation by American Motors Corporation for roughly $70 million. AMC's Chairman, Roy D. Chapin, Jr., was convinced that the four-wheel-drive market was about to start a meteoric climb, and he wanted to be there to cash in on it. A few years earlier, Chapin had headed AMC's overseas sales and production and had found Kaiser-Jeep to be a solid and worthwhile partner in several joint production efforts, and there the seeds of Jeep's and AMC's futures were planted. AMC renamed its new division Jeep Corporation. But it would be two years before the new owner could make any substantial changes to the Jeep product line. And anyway, the 1970 line of Jeeps was already in the showrooms. As in 1969, the 1970 line consisted of the Roadster, Pick-Up, Station Wagon, and the determined Convertible. All were Commandos. Jeep was advertising its entire line under the theme "The Two-Car Cars," a reference to their usefulness as both fun cars and work vehicles. There were few changes, save for the addition of power steering as an option for V-6 models. 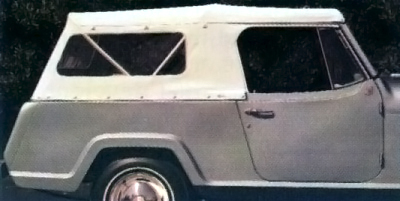 For 1971, Jeep introduced two specially trimmed Jeepster Commando Station Wagons. The SC-1, with a standard V-6 engine, roof rack, radio, sporty wheel covers, finished in Butterscotch gold paint with a black sport stripe, was a handsome sporty wagon that had looks and power and showed yet again the changing trend toward sportier sport/utilities. This glamour job wasn't a convertible, as might be expected, but instead a high-trim family wagon. The sporty trend was further evidenced with the second specialty Commando, the Hurst Jeepster. This wagon was supposed to be a performance model, but was hampered by the lack of an engine larger than the V-6. However, it did sport red-and-blue rally racing stripes over its Champagne White paint, plastic hood scoop with a built-in 8,000-rpm tachometer, roof rack, special 15-inch steering wheel, and G70-15 wide-tread Polyglas tires. Interiors could be done up in charcoal, blue, or buckskin. The package, which carried Hurst/Jeepster emblems on the hood and tailgate, was quite attractive, but failed to sell in significant numbers. A joint effort of Jeep and Hurst Performance Products, 500 units were planned. 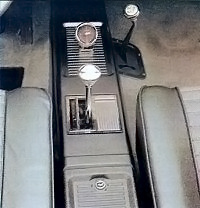 According to one source 300 were equipped with Turbo-Hydromantic and a Hurst Dual-Gate shifter, while 200 got the standard three-speed manual with Hurst T-handle shifters. According to another source, however, less than 100 were actually produced. In any case, the balance of the 1971 line was carried over with few changes. The 1971 Hurst Jeepster Commando featured red-and-blue rally stripes over Champagne White paint. AMC put together a team of product planners to work on enhancing the Jeep product line. James W. Alexander, a long-time AMC employee who had formerly run an interior design studio, was one of those planners. Recalls Jim: "It became apparent that a larger vehicle was going to be needed to compete with the Blazer. We began to work on that, and to give the existing product a few more years of sales, we went ahead with a front-end redesign for the 1972 model year. The designer, as I recall, was an ex-Kaiser designer who came with the buy-out of Kaiser-Jeep, a fellow by the name of Jim Anger." Jeepster History and Notable Niceties. The Jeepster, Jeepster Commando and Commando lines had some unique and unusual niceties ever put into a Universal Jeep based vehicle. This vehicle as we affectionately call the “Peepster” or the “Bullnose” was targeted to a more youth conscious; upwardly mobile growing population. People were getting more and more used to modern day conveniences in their everyday lives and the new brands of vehicles had to keep pace. The Two Car Car and Holy Toledo! What a car. Women where most definitely targeted in this new segment and Kaiser knew that they would not put the kids and groceries in the old tried and true work horse CJ. It was not comfortable, safe or convenient to use. Nor would this new population of “Fun Seekers” take a plain Jane farm Jeep to dinner downtown wearing a suit or a dress or pick a client for a work event. 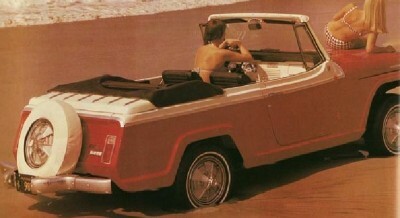 SO the Jeepster Concept was born. AS you look at the old advertising you will see this trend carried throughout the line and reflective of the changing times and activities people sought. The day bough brochure of the 67 Jeepster Deluxe Sports Convertible no less shows a happy couple just after landing their private plane and jumping in the stylish go anywhere Jeep. Some of the new things for a Universal based Jeep that where firsts in the Jeepster are as follows. Color matching foam dash pad, seat belts, (optional Console), seats, carpet kit, door and interior panels, steering wheel , exterior paint and matching top or headliners. Available console for either a 3sp or an automatic transmission. A completely integrated mechanical top in either power or manual. Never has a jeep had this since or today. Truly an engineering marvel on a 4x4 chassis. Custom smooth chrome bumpers which were carried into the deluxe special CJ line as well. Integrated Speedometer which all gauges in one neat package with circuit board. Recessed taillights in the body of the Jeep. No more plastic hang on to be snapped off. Solid rocker panels eliminated the step up and over entry. This made it much nicer for women and men. Integrated window glass in the door! No clunky frame surround to deal with made a neat clean half door car appearance. What a huge plus we would not see again till the YJ. Last but not least the much loved “Mono-Leaf” spring for that smooth and luxuriate ride. When the Commando came on the scene and AMC had bought them from Kaiser they came back in and added more featured on the safety side. These included power steering and Saginaw style componentry. They included things like side marker lights and more modern internal AMC engine options. Some of the tweaks inside were the chopping of the fenders in the back for more elbow and le room as well as lowering the rear step height inside. Interior color matching was retained and they added full vinyl interior body kits as well. Soft tops from full Safari to Half soft tops in a variety of theme colors. ©2015 Jeepster 50th, All Rights Reserved.